Following the growth within the Eastern Cape, with Grahamstown as the main settlement in the region at the time, FNB’s predecessor, the Eastern Province Bank, was established in the town during 1838 focusing mainly on the financing of the wool industry following the wool export boom in the district. 22 December - Potchefstroom was established. Ever wondered what First National Bank (FNB) and photography have in common? They both came into existence in 1838. Also of interest is that the mechanically propelled bicycle, as we know it today, was only designed the year after the establishment of the Eastern Province Bank, namely 1839. Andrew Smith began publication of Illustrations of the Zoology of South Africa. The existing First National Bank (FNB) is not only viewed as South Africa’s oldest Bank but also appears to be one of the oldest companies in South Africa – granted, with several amalgamations and mergers along the way (click here for a list of South Africa's oldest companies). Ironically many of the companies listed as older than FNB are wine farms! The earliest existing company on the list is Blaauwklippen (1682). During 1890 there was one bank that was older than the other banks in existence, namely the Cape of Good Hope Bank (established 1837), but this bank collapsed during 1890 following a depression. The intention of this article is to take the reader through a brief photographic journey of the bank’s existence (mainly between the 1880s and 1920s) by sharing photographic material as produced on picture postcards and original photographs of that era. Large format images taken by professional photographers of special events or larger groups. The main challenge has been to link individuals (for whom photographs exist and where names are known) to a specific bank or branch. By 1874, the Eastern Province Bank had expanded with four additional branches based in Grahamstown, Middelburg, Cradock and Queenstown. The six Bank of Africa branches depicted above existed prior to 1912. The Port Elizabeth branch later became the National Bank branch (see the street view of this building later in the article). This stately building was sadly demolished during the 1950s. At about the same time, gold was discovered in Barberton and the Witwatersrand, resulting in the government creating a bank through a concession agreement. The task of the bank was to focus primarily on financing agricultural development. A State Mint was also established as part of the concession. De Nationale Bank also became known as the State Bank. De Nationale Bank – A valuable brass sign, probably more than 120 years old (dates from before 1902), would have been mounted on a wall at the entrance of the branch. 1. BH Haas; 2. GRJ Bodde; 3. H Hartel (deliveries); 4. JC Haarhof (Bank’s attorney); 5. H Henning; 6. GRR Wreford; 7. SO Cullingworth; 8. H Blackmore; 9. A. Deeker; 10. EE Sime (Accountant); 11. E David; 12. W Dunlop; 13. Victor Schoenmehll (Secretary); 14. BW Begeer; 15. Dr Wilhelm Knapp (Joint General Manager – resigned 1893); 16. TW Beckett (Chairman); 17. President SJP Kruger; 18. J Boshoff (Treasury General South African Republic); 19. C von Boeschoten (State deputy secretary); 20. Hermann Militz (Joint General Manager – resigned 1894); 21. E Hartel (Coin accountant); 22. LE Kothe; 23. P Mynhardt; 24. TA O’ Flaherty (Manager Pretoria branch); 25. WE Niemeyer; 26. CP Mathews; 27. WH Priddey; 28. N. van Dalsen; 29. AC Duff (Head Office accountant); 30. W van den Berg; 31. James Sinclair; 32. A Waterstradt; 33. KO Simon (Coin officer); 34. A Crorlich (Coin officer); 35. G Hocke (Coin officer); C van Leenhof (Coin officer) – Additional information on Dr Wilhelm Knapp and TW Beckett is included towards the end of the article. Cabinet Card format photograph of J. Home who would have been a manager at the Natal Bank Ermelo branch. Circa mid 1890s. Real Picture Postcard format photograph of GH Green who would have been a manager at the Natal Bank Volksrust branch. Circa 1910. Cabinet Card format photograph of ES Allsop (By Larsen brothers) – 1912 – A Natal Bank employee at the Vryheid branch. The six branches above may have existed as either Bank of Africa or Natal Bank branches prior to their takeover by the National Bank. During 1954 Barclays Bank (Dominion, Colonial & Overseas) changed its name to Barclays Bank DCO. During 1998, the financial services interests of Rand Merchant Bank Holdings and Anglo-American Corporation (which included their shareholding in First National Bank), were merged to form FirstRand Limited, resulting in FNB becoming a wholly owned subsidiary of FirstRand Limited - currently trading as a division of FirstRand Bank Limited. First National Bank (1987 to date). Pretoria – November 1903. In the centre of the image is the Natal Bank branch, to the left of this building is the Bank of Africa. The building on the right is the Standard Bank branch. The main, and most important root in First National Bank’s early history is the old State Bank of the Transvaal Republic – De Nationale Bank der Zuid-Afrikaansche Republiek Beperkt (NBZAR). 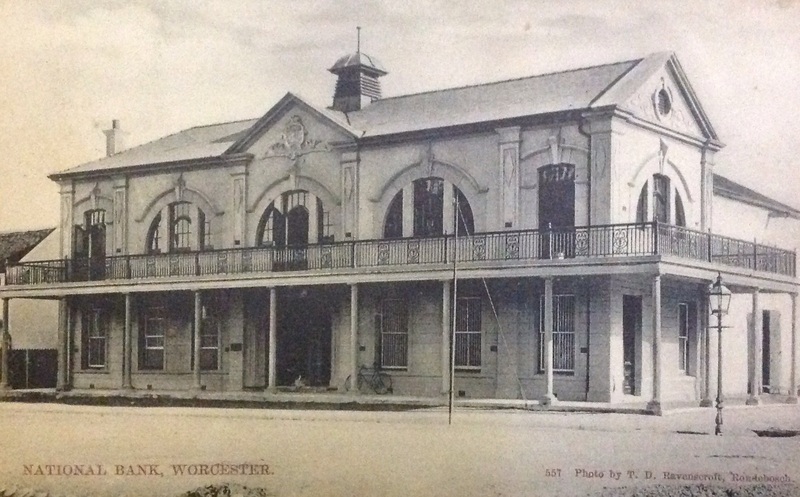 This bank was originally registered in Pretoria in terms of a concession for the formation of a bank and mint, which on completion was to be transferred to the Z.A.R. Government ownership, who in turn leased the Mint to the bank. During the Anglo-Boer War, it was often business as usual for the banks who showed great resilience. However, near bankruptcy threatened some, large sums of money were commandeered from others, branches were running short staffed or were lost and employees had their loyalties to the bank and countrymen badly strained. Anecdotes of directors and managers in the minute books of the founding banks, makes for interesting reading. Directors were slightly annoyed by the inconveniences of the war. De Nationale Bank (NBZAR) – Pretoria staff - 1893 (Sitting from left to right Blackmore, Sime, TA O’Flaherty (Manager), Dunlop, Preddy; Standing from left to right David, van Dalsen, Mynhardt, Niemeyer, v.d. Berg & Sinclair (cricketer). Both van Dalsen & Niemeyer (standing at the back) seem very young. Mynhardt also appears in the image with Kruger below (position 23). The gentleman standing in the window as well as the African employee are sadly not named on the photograph. De Nationale Bank (NBZAR) – Board of Directors – 1896 (Seated - Third from right is the chairperson TW Beckett – a Pretoria businessman). Other parties in the image are: JN Boshoff (seated first from right), EF Bourke, Hugh Crawford (became chairperson and managing director post July 1902); TN de Villiers; Thomas Hugo (passed away shortly after this photograph was taken), Dr. Josef Magin, JS Marais, GAA Middelberg (attached to NZASM – South African railway company), Johan Rissik, Victor Schoenmehll (standing – first from left) & Karl Wolf (Deputy chairperson – a Pretoria businessman). The exact position of the other 9 directors on the image still needs to be determined. De Nationale Bank (NBZAR) Pretoria staff – Circa 1895. Portion of a damaged photograph (includes a Thomas Louw). Would the young boy sitting in front also have been a staff member? National Bank of South Africa – Head office staff – 1906 – If compared with the image taken of the board of directors during 1896 (above), it is evident that fashions have changed over a ten year period. On the image captured during 1896, all sitters except one, have beards whilst in this image none of the sitters have beards. Most of the branches were kept open during the Anglo-Boer War, but occasionally a manager had to flee to safety with the assets of the branch into a neighbouring friendly territory or to some town in the state where protection was assured. The Natal Bank had several architecturally significant branches built between 1890 and 1900. The Johannesburg branch of the Natal Bank initially was a single-story building, but due to their competitors all having double storey buildings in Johannesburg at the time, the Natal Bank followed suit and constructed a double storey building by 1902. This building became known as the National Bank’s Natal Bank branch. Natal Bank - Johannesburg branch on Market Square (Pre 1900) – When the Natal Bank was still a single-story (building on the right). Natal Bank - Johannesburg (Pre 1914). The new double-story building. National Bank - (Natal Bank of South Africa) - 1921. All 55 employees have their names inscribed on the photograph - 25 of which are female. The Bank of Africa also had a corrugated iron building on the edge of the Kimberley hole during 1882. This building eventually collapsed into the big hole during 1884. The day before, in broad daylight at about 10am George Heys & Co.’s mail coach had been held up shortly after leaving Pilgrim’s Rest, where it had picked up four passengers and gold from the local branch of the Nationale Bank for consignment to Headquarters in Church Square, Pretoria. The armed robbers forced passengers and the driver to lie under the coach while they unharnessed the mules. Then taking the gold from the boot of the coach they mounted their horses and rode off up the road. However, the brakeman of the coach (who rode on the back of the coach) had jumped off and doubled into the bush. The robbers put a bullet through his hat but he escaped unhurt and then gave alarm. Burghers and police from the village were soon on the scene. They found the passengers and Du Plessis, the driver, handcuffed lying under the coach and the bullion boxes scattered all around. They questioned the men as to which way the robbers had gone and rode off after them. Just before dark they caught sight of them in the distance but could not catch up with them before night fell and the trail was lost. (Allen, 1971 - with slight amendments by the author). Labour problems that were torturing the country during the early 1920s did not leave the banking industry unscathed. Pay disputes and poor relationships between employer and employee took the members of the Society of South African Bank Officials (SASBO – established 1917) out on strike, albeit for a mere 3 hours, before the banks accepted their terms and the action was called off. This was the first and only strike in the banking industry. To alleviate the labour shortage created by some 300 male employees who had to be released for the war effort, women were first employed as clerks on a temporary basis during the First World War (1914-1918) at the National Bank. Sadly, no effort was made to increase the staff compliment of qualified black citizens at the time. Permanent employment for women only became a reality during the 1920s under the Barclays Bank banner. During the Second World War (1939 - 1945) another shortage existed due to men being enlisted into the military, resulting in an increase of female employees. The female workforce within Barclays at the time of the war stood at around 33%. Female employees were however mainly employed as telephonists, receptionists, secretaries, clerks and general assistants. Joan Ricketts became the first woman to be appointed into a senior role in a large branch during the 60s. This would have been whilst the Bank functioned under the then Barclays (Dominion, Colonial & Overseas) banner. Cabinet Card format photograph of RH Friend - Circa mid 1890s - A rather sophisticated looking gentleman who clearly would have been a manager at De Nationale Bank Port Elizabeth branch. As can be imagined, over the years the bank certainly employed some interesting personalities, each with their own unique story. The details below are a reflection on one director and three employees in the bank’s earlier history. Thomas William Beckett - First chairman of De Nationale Bank de Zuid Afrikaanse Republiek (1891-1900). Known as a benevolent individual, Beckett was one of the first traders to settle in early Pretoria during 1874. He established the well-known store T.W. Beckett & Co on the corner of the then van der Walt and Church streets. This business secured a contract, amongst many other similar contracts, to supply all picks and shovels needed for the work on the Delagoa Bay Railway. He married Annie Orsmond from Bloemfontein during 1874. They had 16 children, 4 of whom passed away at early infancy due to typhoid fever. An important part of the Beckett story is that, during 1864 aged 13, he and his father left his mother and younger siblings in Australia to travel to South Africa. It appears as though Beckett senior never saw his wife again. This begs the question – did Beckett junior see his mother again? It has been suggested that Beckett delivered his first presentation in Dutch at the opening of De Nationale Bank on 20 April 1891 (see position 16 on image with Paul Kruger above as well as the image of Board of Directors from 1896). He passed away during 1924 aged 67. A street in Arcadia, Pretoria was named after him. Dr Wilhelm Knappe - First manager of De National Bank der Zuid Afrikaanse Republiek. He first arrived in Pretoria from Germany to negotiate, on behalf of a syndicate of European Bankers, for a concession to start a Bank in the then Republic. This concession resulted in the establishment of the De Nationale Bank der Zuid Afrikaanse Republiek (NBZAR) and the Mint. After the negotiations he returned to Germany, only later to accept the role as joint general manager of the same Bank in Pretoria (See position 15 on image with Paul Kruger above). Knappe resigned during 1893. Friederich Munscheid from the German Imperial Mint in Berlin was engaged by Dr Knappe to set up the Mint in Pretoria. Munscheid arrived in Pretoria at the end of 1891 after travelling for 3 months by ship to the Cape, followed by a train journey to Bloemfontein and from there by ox-wagon to Pretoria – this all with three rather large and heavy minting presses made by Berlin based Ludwig Loewe & Co. The Mint reached full production during 1893. The Johannesburg based Natal branch, which later became the Barclays Bank, used to house the First National Bank Museum. This building was sold, resulting in all artefacts now being housed at the Bank’s head office in Johannesburg since 1998. The Natal Bank building was restored in 2017-2018 (click here for details). Photographic images included in this article are mostly older than 100 years. Will future generations, more than 100 years from today, have any interest in any organisation’s visual history – about its employees and buildings as they exist today? The author has been a proud employee of the FNB group for the past 38 years. He initially joined Barclays Bank in Pretoria as a trainee computer operator during 1981. This article is presented from a photo historical perspective and is not meant as an FNB advertorial. Real Picture Postcard format photograph of JD Griessel who would have been a manager at the National Bank Johannesburg branch. Circa 1924. Acknowledgement: Rosa Swanepoel (Pretoria historian) for her assistance in providing the names of the men on the 1896 Nationale Bank’s Board of Directors photograph included in this article. Main image: National Bank – Lichtenburg. This image (circa mid 1910) creates the distinct atmosphere of a small town farming community bank.